The following words constitute a review of the new novel Welcome to Night Vale. The review is not about Welcome to Night Vale. It is totally about it and is for your enjoyment. Do not read the following review of Welcome to Night Vale. If you do read it, please report yourself to the Sheriff’s Secret Police. You are not allowed to read this review of Welcome to Night Vale. Please enjoy reading the following review of Welcome to Night Vale. For those not familiar with the hit podcast, imagine Welcome to Night Vale as a story about a town in the middle of the desert (What desert? There is no desert. See? There’s the boardwalk right there! Towns in deserts don’t have boardwalks!) where every episode of the Twilight Zone is taking place simultaneously while featuring the cast of Twin Peaks and everyone pretends that it isn’t happening while also fully acknowledging it is happening. ALL HAIL THE GLOW CLOUD! A macabre mash-up of horror, scifi, conspiracy theories, stream of consciousness, and humor (DO NOT LAUGH AT THE GLOW CLOUD! ), Welcome to Night Vale surprisingly fits in novel form. Written by the podcast’s writers/producers Joseph Fink and Jeffrey Cranor, the novel weaves the narrative threads of two of Night Vale’s residents as they struggle to figure out the mystery of two words: KING CITY. 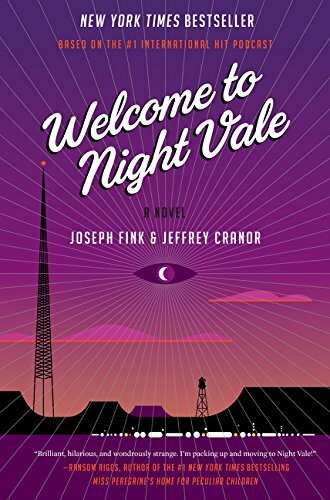 The storyline keeps readers interested while also confusing the living hell out of them due to the contradictory nature of Night Vale itself. Not that there is anything contradictory about Night Vale. Everyone knows and understands how things work in Night Vale. Everyone. Understanding is compulsory and mandatory. If one does not understand then one should report directly to the City Council for reeducation. Their monotone, unified voice will cram the understanding where the never setting sun always shines. Or sets. The sun sets, silly. There is no sun. The sun is a lie. Drink Pepsi. Being Welcome to Night Vale, the book is interspersed throughout with chapters of The Voice of Night Vale (surprisingly not the Glow Cloud despite said cloud’s appointment to the school board), Cecil Gershwin Palmer reading the latest news from the Night Vale Community Radio Station. Sometimes he talks about the dog park, expressing that the City Council would like everyone to know there is no dog park, but that the dog park is also meant for everyone’s enjoyment. Do not talk about the dog park. Cecil, of course, being Cecil, does not report on the angels that live with Old Woman Josie out by the Car Lot. Angels do not exist. Please do not talk to the angels if you come across one. There are no angels. This review could go on forever, and probably has in some parallel universe under Lane Six at the Desert Flower Bowling Alley and Arcade Fun complex, but words cannot do justice to Welcome to Night Vale. It is a book that must be experienced, just like the midnight blood sacrifices that all are required to attend, but do not attend, yet say they do anyway. Sort of like Woodstock. To sum up: Read Welcome to Night Vale if the absurdity of life you already experience isn’t enough to push you into a temporary ennui due to the fact you drove past one of the hooded figures that has escaped the dog park. The City Council would like to remind you that there is no dog park. And now, the weather . . .